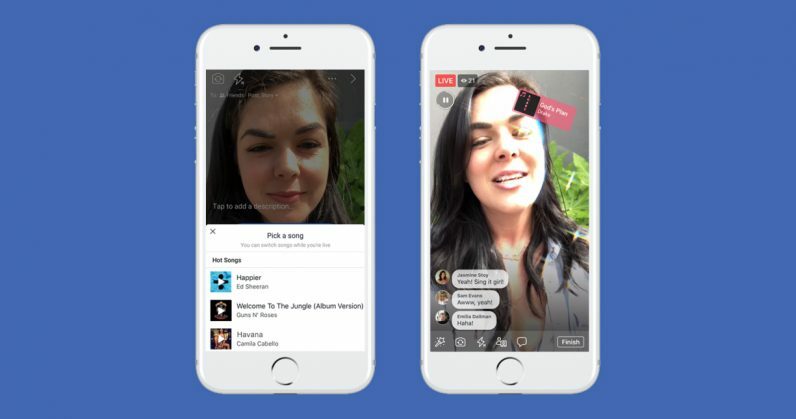 After stealing several features from Snapchat for use in its own app and in Instagram, Facebook is now taking a leaf out of Musical.ly’s book to introduce a lip-syncing feature in users’ live video broadcasts. When you choose to shoot a live video on your phone in Facebook’s mobile apps, you’ll now find an option to include a popular song to lip sync with. That’s a lot like what Musical.ly offers. The app, which first launched in 2014, is all about dancing, acting, and lip syncing along to music and dialogues from popular artists, movies, and TV shows. Musical.ly was acquired by Chinese firm Bytedance (which owns the news aggregator Toutiao) for $1 billion last November, and has garnered some 200 million users around the world. It also launched a $50 million fund to support creators on its platform at the end of last year. It’s worth noting that while Facebook’s new functionality is similar to Musical.ly’s, there are some major differences. For starters, Facebook’s lip sync tool only works with live broadcasts, and there isn’t a way to filter live videos in your feed to surface only those using the lip sync feature. Meanwhile, Musical.ly offers more tools for recording and customizing clips, and feels more like Dubsmash, or Instagram – but only with lip sync videos from its community. Facebook’s move is part of a larger mission to allow users to incorporate copyrighted music into the content they share on the social network. It’s cut deals with record labels and distributors to allow the use of songs from the likes of Drake, Camila Cabello, and Guns N Roses to be used in live and recorded clips. It remains to be seen if that’ll be enough to get kids to use its app more often.